What’s an ideal wine for the Fourth of July? Depends on your perspective, but my suggestion is a wine that is a chillable, crowd-pleasing quaffer that pairs with picnic plates, barbecue, and finger foods. If it’s a red, make sure it’s light on the tannins. Whites — or better yet, rose wines — should have a soft mouthfeel, with enough acidity to stand up to outdoor party dishes but not so tart that they taste sour when drunk alone. Then there is the Independence Day theme: the wine doesn’t necessarily have to be from the USA, but it would be a nice touch. At the very least, it should embody the spirit of American independence — perhaps represent rebellion. With those factors in mind, my specific suggestions come from Macari Vineyards in Long Island, New York. American, obviously, so check that off. Independent? 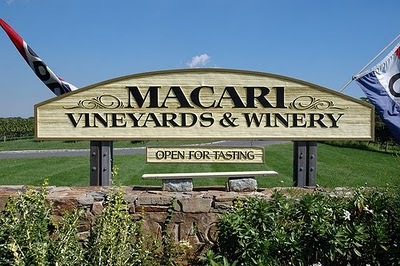 Check — the winery and vineyards are owned and operated by the Macari family. Rebellious? Not necessarily, but certainly, the Macaris fit the mold of what we like to think of Americans: bold, brave, pioneering, responsible, and always striving to improve. Only an American would try to grow French grapes on a potato field in Long Island — and succeed. Oh, and by the way this was accomplished naturally and organically, without pesticides or chemicals, using biodynamic methods and sustainable farming techniques. Mostly Merlot with Cabernet Franc, Cabernet Sauvignon, and Malbec blended in. The nose, to me, is expressing red wine, and similar to what I normally associate with Beaujolais — cherry, ripe overripe banana, hint of orange marmalade — but it also has some bright citrus. In the mouth the citrus fruit is most apparent; it’s a juicy, tasty flavor that resembles a mix of lemon, lime, blood orange, and a bit of ripe red cherry. Good chalky acidity holds the fruit together and makes it ideal for food matching. The finish has a nice mixture of red berry and citrus peel. I matched this perfectly with a curried chicken salad recipe found online, and it was also delicious on its own. I reckon it is equally good if paired with meaty fish, other chicken dishes, and pork, as well as just about anything coming off the grill. Hmm … the grill … it’s from New York, it’s friendly for food pairing, and guaranteed to be a crowd-pleaser … I’m gonna go on a limb and say this is PERFECT for a July 4th barbecue! But what if you’re a “tough guy” who doesn’t want his friends seeing him drinking pink wine at the picnic? Luckily, Macari also makes a Merlot that you can bring to the party. Bright, ripe strawberry, raspberry, and cherry aromas jump out of the glass at first sniff, with some hints of earth and mineral. The palate is wide open and full of sweet strawberry and cherry upfront, followed by a dry cranberry and pleasantly sour black cherry flavor in the finish. Tannins are there but understated and mild; acidity is also fairly mild but enough for food matching. This reminds me more of Pinot Noir than Merlot, and that’s not necessarily a bad thing, particularly if you don’t like the bell pepper aromas and flavors typical of Merlot (that element does not exist in this wine). This is a 2008 vintage, and it may be peaking right now. It’s delicious on its own, but I found it more enjoyable with simply roasted turkey. Try it also with other poultry (grilled chicken drumsticks!) and full-flavored fish such as salmon. This wine is really well done and is a great ambassador to the red wines of Long Island. Use Wine-Searcher to find Macari Rose and Macari Merlot at a retailer on your way to the barbecue. You can also learn more about these wines and the winery by visiting the Macari Vineyards website. Disclosure: I received these wines as press samples from the winery.